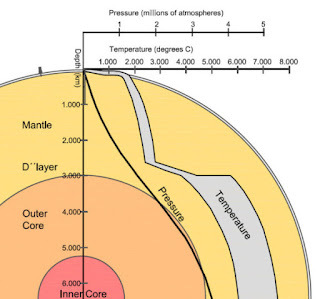 In a depth of 1,800 miles, mysterious 'mountains' float along the D''-core-mantle boundary since the birth of Earth. How seismic waves are reflected or scattered inside Earth has long shown that the planet's interior is not uniform, but can be subdivided into various layers. Earth's crust is composed of less dense crystalline rocks, like granite and gabbro. Earth's mantle is composed of magnesium, iron, and silicon dioxide and it's estimated to make up 38% of Earth's volume. The outer core is liquid, composed of very dense elements, like iron, nickel, with traces of sulfur and oxygen. The inner core is solid, almost a pure iron-nickel alloy, maybe even with a crystalline structure (making it possibly Earth's largest crystal). Seismic waves have also shown that along the boundary layer between mantle and core, strange blobs or plumes, rise up for many thousands of miles. One hypothesis explains the blobs as remains of partially molten tectonic plates, sinking from Earth's surface into the mantle. The melting plates can´t sink into the much more dense core. Melting completely along the boundary, the remains of the plates form blobs of material, slowly floating back to the surface and driving there the motion of Earth's tectonic plates. 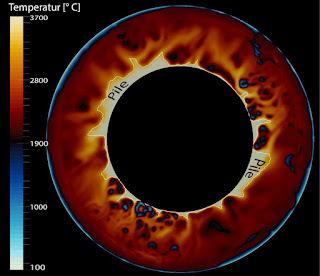 Another, more recent, hypothesis explains the blobs as remains of Earth's primordial crust. During Earth's formation a first, primitive crust developed on the cooling surface. Parts of this crust sunk into the mantle, too dense to rise, the material boils slowly there since Earth´s formation. 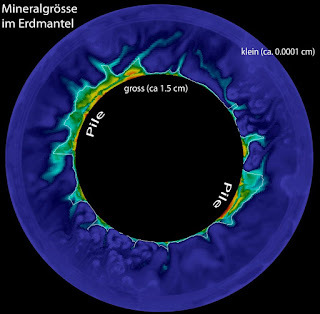 Computer simulations presented during the European Geosciences Union conference in Vienna suggest that the plumes are composed of crystallized material, as the long permanence of the material under high pressure and temperature makes it possible to grow grains of minerals, some inch in diameter. 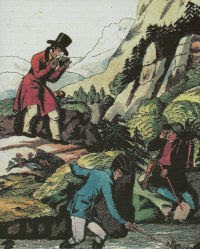 As mineral grains form rocks, the plumes are composed of rocks, making them miles-high 'mountains' (sort of...), even if at a temperature of 5,000°C. Definitive Proof of Flat Earth Revealed !! !